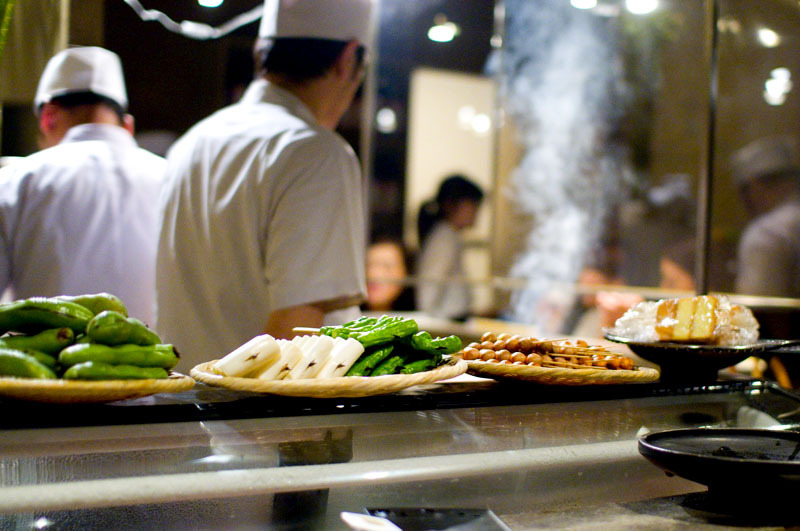 Fuku is a charming little place that follows traditional, time-honored methods for creating first-rate yakitori. They start with very fresh top-quality free-range chicken, which is expertly cut and placed on skewers. These are then grilled slowly and thoroughly over Japanese bincho charcoal. The grill itself is surrounded by counter seating, and though it puts out a great deal of smoke, a clear plexiglass hood directs most all of the smoke to the huge ceiling mounted exhaust fan. This leaves just a whiff of fragrant smoke and sizzling aromas to give the place a tasty atmosphere. While it may take as long as 15 or 20 minutes to receive your order, the final result is astonishing, particularly if you forego the sweet soy "tare" sauce in favor of plain salt. 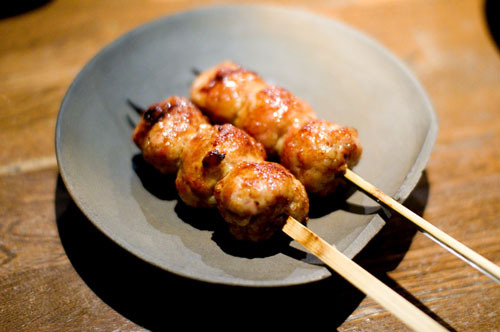 Try a simple "kashiwa" - chunks of chicken thigh meat on a skewer. The chicken is crispy yet succulent, with a faint smoky flavor and a rich sweetness to the flesh. This is certainly chicken at its simplest, and likely its finest. All popular cuts of yakitori are represented on the menu, along with a few unusual items. 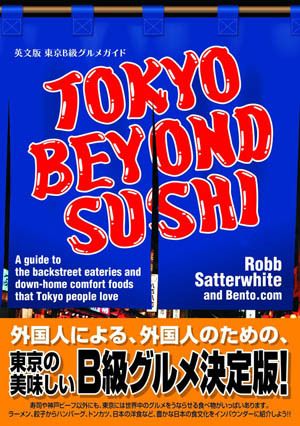 One example is "bonbonchi" - the fatty cut near the tail of the chicken - which is more commonly known as "bonchiri." This takes quite a bit of time to prepare, and if you are lucky to snag a counter seat you can see the chef turning the piece over from time to time. He moves it alternately between the hotter and cooler sections of the grill, getting the skin to sizzle nicely as the fat gets slowly cooked out. The chicken wings (tebasaki) are cooked in the same way, and these are truly outstanding. By the time they arrive - two linked by two skewers - all external surfaces are deeply crisp, while the plump meat inside is still exquisitely tender. Once you've gone through the tempting crunch of the skin and the soft sweet meat, the only thing remaining will be the bones, and perhaps a tiny portion of the tip of the wing - everything else is delightfully edible. There are also many seemingly ordinary food items which turn out to be special. One example is the potato salad, which is lighter and uses less mayonnaise than the normal store-deli variety. Another is the smoked cheese - small hunks of processed cheese that have been deeply smoked at Fuku, then warmed slightly on the grill before serving. For all this quality, Fuku is surprisingly inexpensive, with most grill items priced at between 150 to 250 yen. 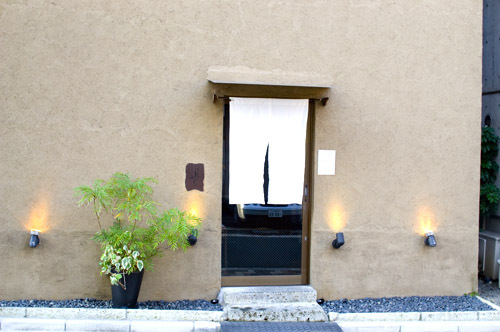 Drinks are also inexpensive - a round of food with a couple of drinks will run about 2,500 to 3,000 yen per person. Fuku's menu is both in English and Japanese, and for some reason the English descriptions are more detailed than the Japanese.